LinkedIn can be an extremely powerful and effective sales tool that can help open doors and facilitate conversations that a small business owner previously would have never been able to have. It can also be overwhelming and confusing to users who don’t have the time to invest in researching how each of the professional social network’s features work. 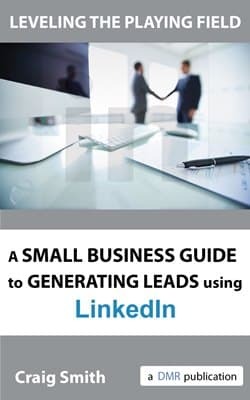 Earlier this summer, I authored Leveling the Playing Field; A Small Business Guide to Generating Leads Using LinkedIn, which was offered exclusively, until now, through Amazon in the Kindle format. I am pleased to say that this resource guide is now available to all in downloadable pdf format right here on DMR. If LinkedIn isn’t actively generating sales leads for your business, this book is a must read. With Leveling the Playing Field, you will learn how leverage LinkedIn so you can compete against the larger competitors in your industry. I will teach you how to use each of LinkedIn’s core, and lesser known, features to your advantage in your sales efforts. In no time you will be using this powerful social network as a key tool in your lead generation efforts. I have created successful LinkedIn marketing and sales strategies for companies of all sizes, types, locations and industries over the years. I have implemented each of the tactics and tips in this book countless times with clients to build high-performing, successful content marketing and inbound lead generation campaigns. Now, I have compiled all of my LinkedIn strategies and created this book to help you. We all have LinkedIn accounts. It is time to put yours to work and start building your business through networking! For just $3.99, you can download your copy and get generating leads on LinkedIn today! How To: Target LinkedIn Company Status Updates to Specific Followers LinkedIn recently started allowing company page admins to target page status updates to specific users. The targeted updates show in only the LinkedIn...homepages of the targeted groups but still show up on your company page for all users to see. How To: Embed a Facebook Post in a Blog Post Today, Facebook announced the launch of embedded posts. This new feature allows bloggers to add a public post directly to their site and includes some...Facebook engagement functionality such as liking and sharing.